A COMPETITION TAKING place in Dublin today aims to provide a new approach to graduates getting employed with some of the country’s biggest employers. The gradireland National Student Challenge final takes place at the Quinn Business School in UCD today with the organisers, who specialise in jobs and careers advice, believing the competition offers a new approach to getting employed when you graduate. Around 60 students will take a series of challenges set by businesses including Lidl, Pricewaterhouse Cooper, Ernst & Young, Ericsson and EMC which aim to identify their employability skills. The students were chosen after a nearly 1,500 people who signed up online took a test designed to test their numerical and verbal reasoning, commercial competency and employability skills. The 60 students who scored best were then chosen to go forward to today’s final where they will face challenges that include building a ‘cloud’ data centre from old newspapers and being blind-folded before attempting to land a colleague onto a spot using only whistles. 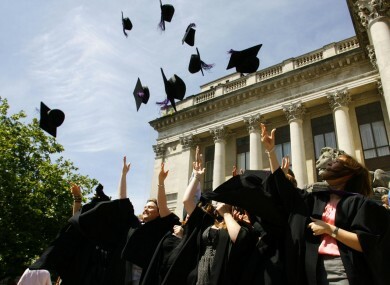 “The first thing that comes to light is something that is often missed in all the talk of recession, austerity and cut-backs – there is still a fight at the top of the graduate recruitment food-chain for the brightest and best students,” Mark Mitchell from gradireland said. Companies are increasingly using competitions to identify graduate talent. PricewaterhouseCoopers and Ernst & Young, who between them took on almost 600 Irish graduates in 2011, also believe the competition will offer transferable skills for graduates. “Competitions help students identify the skills they’ve developed inside and outside university, and explain just how transferable those skills are to every area of business,” Lorraine O’Toole from PwC said. Email “Competition aims for new approach to graduate employment ”. Feedback on “Competition aims for new approach to graduate employment ”.